Connect a DVI display for an extended desktop multi-monitor USB solution using an all-in-one cable solution. 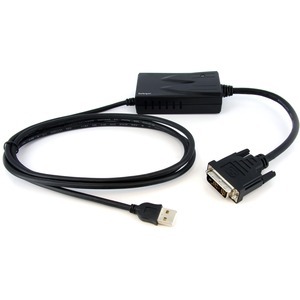 The USB2DVIMM6 External USB DVI Adapter Cable offers a hassle-free multi-monitor solution, turning a USB 2.0 port into a DVI video connection. This 6-foot USB Display Adapter is a complete solution, ready to go out of the box with all the cables you need built right onto the adapter. Simply install the drivers, connect to your computer and display. Built-on cables make the USB2DVIMM6 easier to install and does away with the need to worry about forgetting a cable. Instead of having to open the computer case to install a specialized video card to accommodate a multi-display configuration, USB2DVIMM6 functions as an external USB video card saving both time and hassle. Multiple (USB2DVIMM6) adapters (up to 5 total) can be used on a single system to provide several mirrored displays or extended desktops - a convenient and cost-effective multi-VGA option for virtually any laptop or desktop operating environment. Backed by a StarTech.com 2-year warranty and free lifetime technical support.